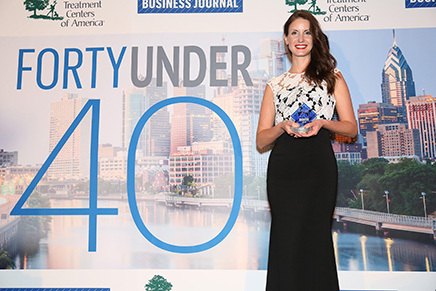 Dr. Eva Anadioti has been recognized by two independent organizations — the Greek America Foundation and the Philadelphia Business Journal – as one of their 2018 40 Under 40 honorees. Dr. Eva Anadioti, Clinical Assistant Professor of Restorative Dentistry and Founding Director of the Advanced Education Program in Prosthodontics. 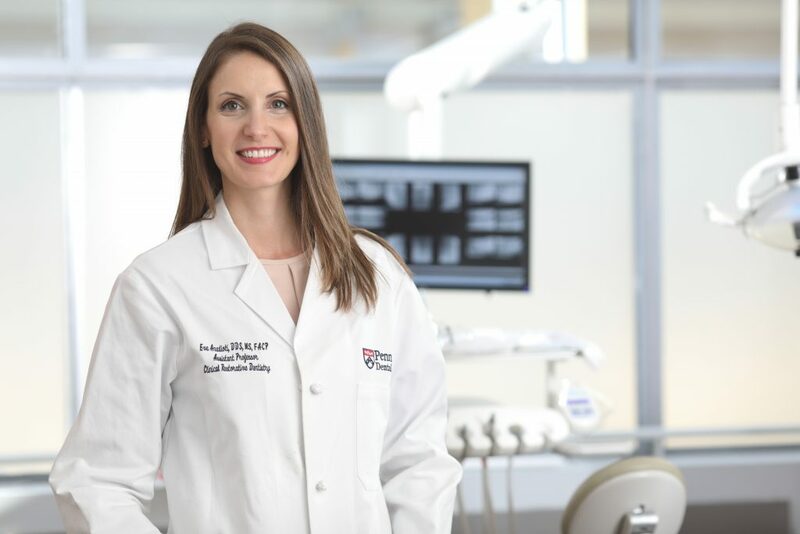 Philadelphia – Penn Dental Medicine’s Dr. Eva Anadioti has been recognized by two independent organizations — one national and another local – as one of their 2018 40 Under 40 honorees. Both the Greek America Foundation and the Philadelphia Business Journal selected Dr. Anadioti for these annual awards. 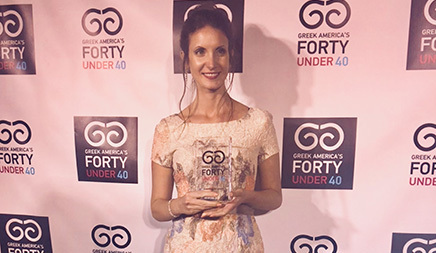 The Greek America Foundation 40 Under 40 recognizes top young talent in business, the arts, and the sciences; and through its annual 40 Under 40 feature, the Philadelphia Business Journal, also aims to identify and recognize current and future leaders in various industries and in the community. A national nonprofit organization, The Greek America Foundation was founded over a decade ago to promote, preserve, and perpetuate Greek culture, history, and ideals. Its 40 Under 40 selection committee reviewed nominations from throughout the United States and Canada and the honorees were recognized as part of its National Innovation Conference, held in Philadelphia May 4-6. The Philadelphia Business Journal’s 2018 honorees, selected by the editorial staff from hundreds of nominations, were recognized at a special event on May 10 and featured in the May 11 issue of the Business Journal. This year’s award was also recognized by the Philadelphia City Council with a copy of the official resolution presented to the honorees. Dr. Anadioti, 31, is Clinical Assistant Professor of Restorative Dentistry and Founding Director of the Advanced Education Program in Prosthodontics at Penn Dental Medicine. Dr. Anadioti was recruited to Penn Dental Medicine in 2015 to develop the program — the School’s newest graduate dental education program, which launched last year, welcoming its inaugural class of students in July 2017. This addition not only builds on the depth of the School’s educational offerings (now bringing the total number of graduate specialty programs to nine), it also enhances clinical services available to the public and research opportunities as well. Prior to coming to Penn Dental Medicine, Dr. Anadioti was Clinical Assistant Professor at Boston University Henry M. Goldman School of Dental Medicine. She is a Diplomate of the American Board of Prosthodontics, having earned both her certificate in prosthodontics and MS in Oral Sciences at the University of Iowa before completing a fellowship in surgical implant dentistry at the University of North Carolina. A native of Greece, she holds a DDS from National and Kapodistrian University of Athens. Dr. Anadioti’s research interests are in digital dentistry and the innovative applications of 3D printing in dentistry. Dr. Anadioti maintains an active role within the American College of Prosthodontists (ACP), the official organization of the prosthodontic specialty, where she has been recognized for her leadership and organizational skills among the women leaders in prosthodontics. She also chairs the ACP Task Force for Developing New Prosthodontics Programs, and since the establishment of Penn Dental Medicine’s program, Dr. Anadioti has been working with other dental schools in the U.S. and Canada to guide them in developing their prosthodontic programs. The Office of Communications is available to assist journalists in contacting our faculty experts to discuss the latest dental techniques and technologies. To schedule an interview or locate a faculty expert, please call 215-573-8224, or e-mail Beth Adams at adamsnb@upenn.edu. The Penn Dental Medicine Journal is published twice a year for the alumni and friends of Penn Dental Medicine, featuring stories on the School’s programs and activities and news on faculty, students, staff, and alumni.